All double rooms are ensuite with shower facilities, and have flat-screen Freeview TV. Tea/coffee making facilities, complimentary toiletries & hairdriers are provided, with ironing facilities available on request. Some rooms with sea views, king size beds, DVD. Large two-room family unit situated at rear of building a few steps from sunlounge. 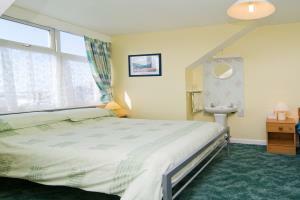 Main bedroom has king-size double bed, second room has 3’ singles with substantial shower ensuite in-between. Flat-screen Freeview TV in both rooms, DVD in master bedroom. Tea/coffee facilities, complimentary toiletries & hairdrier provided, with ironing facilities and cot available on request. Parents/guardians and children only, not available online for more than 2 adults - please call for other options. » Includes Full English breakfast, Vegetarian options available. 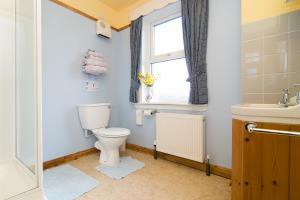 Double room with private bathroom situated just outside bedroom door. Flat-screen Freeview TV, tea/coffee making facilities, complimentary toiletries & hairdrier are provided, with ironing facilities available on request.